Serve with a rice pilaf. In a medium bowl, combine brown sugar, vinegar, oil, soy sauce and mustard. 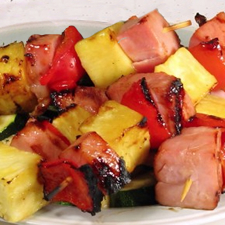 Thread ham, pineapple, green pepper and mushroomsalternately on skewers. Lightly oil grill and heat to medium high heat. Grill sewers basting liberally with brown sugar mixture, 8-10minutes, turning and basting until nicely browned and glazed. Sprinkle with salt and pepper to taste. Makes 4 servings. COOK'S NOTE: I often change out the mushrooms for either red onion, zucchini or cherry tomatoes. All tastes equally good. If pineapple is in season, by all means use fresh. Just cut into one inch cubes. You will need about 1 3/4 cups. Per Serving (per skewer): 185 Calories; 5g Fat (24.5% calories from fat); 16g Protein; 21g Carbohydrate; 4g Dietary Fiber; 27mgCholesterol; 920mg Sodium. Exchanges: 1 1/2 Lean Meat; 2 1/2 Vegetable; 1/2 Fruit; 1/2 Fat; 0 Other Carbohydrates.